UPDATE: Hey everyone, apologies for the delay! Bottles are at: A2 (Where A is the column and 2 is the row. ), B3 etc. There will only be one winner per image. The first to spot all the bottles of BRAND'S Essence of Chicken wins for that particular image. 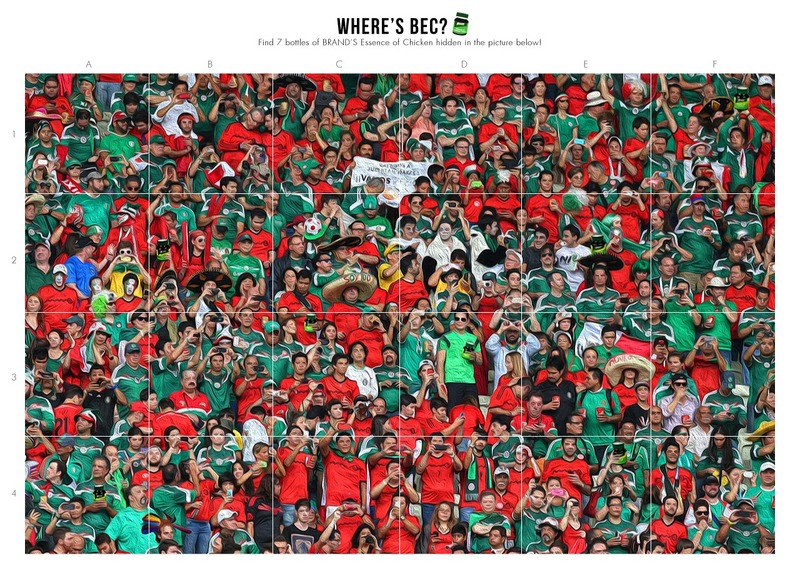 If none of the participants spot all the bottles of BRAND'S Essence of Chicken, the participant who spotted the most number of bottles wins. Not all hat-tricks are celebrated in the soccer world, as Luis Suarez has come to prove. Seemingly living by the motto "If you can't beat 'em, bite 'em. ", Suarez recently completed his hat-trick of bites with Ajax, Liverpool and just a few days ago, Uruguay. Nobody knows for sure the reason behind his weird fetish but what we do know is that the Uruguay star player has been banned for 9 matches, all football activity for four months and fined US$112,000. 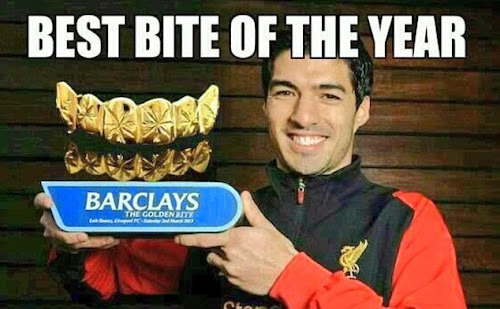 Way to go Suarez. The Portuguese team captain and Real Madrid forward is widely known as the world's best player, the world's most expensive player and the player with the ever-changing hairstyles. Well, there could be a good reason for that too. Ronaldo fans are probably familiar with his famously weird pre-game 'rituals', but for those who aren't too familiar, here are a few superstitions the world class player reportedly practices. Ronaldo insists on sitting alone in the back row and he must be the last one to leave the bus. The Portuguese player has to change his hairstyle in the locker room at halftime during every game. In fact, he needs a new hairstyle before every game he plays. He must touch the ball before leaving the dressing room. 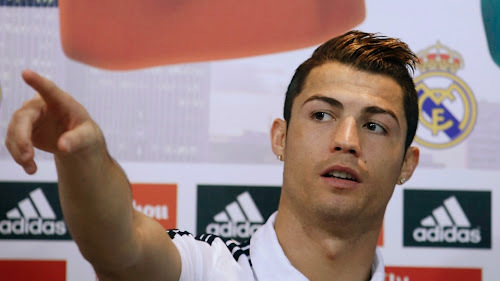 In the Portugal national team, he is the only Portuguese who is allowed to start off with a long-sleeve jersey. He always steps onto the pitch with his right foot first. Well, we don't know how true all of the above are, but we know you are going to be looking out for these signs from now on. 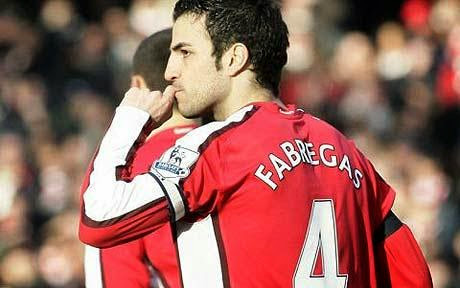 In case you have never watched the "Beats by Dre" commercial, here's how Fabregas, star midfielder of the Spanish national team wishes himself good luck – by kissing a ring given to him by his girlfriend four times. 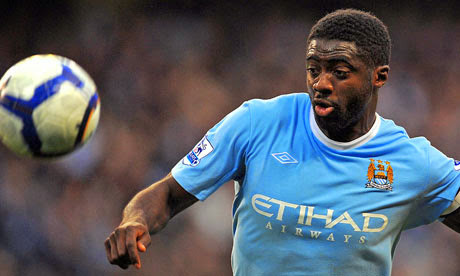 Kolo Toure, a highly valued member of the Ivory Coast national team, always insists on being the last player from his team to walk onto the playing field. This pre-game ritual is so important to Toure that he reportedly once missed the start of the second half of a Champions League Game while waiting for a teammate to precede him. Goalkeeper of the Spanish national team, Iker Casillas is interestingly known to be one of soccer's most superstitious players. He has countless rituals that he modifies depending on the progress of the match, such as changing his jersey every time he concedes a goal or cutting the sleeves off his shirts, etc. His most consistent one would be touching the crossbar every time his team scores. And his most disgusting one? Wearing his socks inside-out during matches. But he has reportedly kicked that habit since 2009. Thank goodness. The World Cup 2014 series is a collaboration between Charlene J. Lee and Brand's. Images are taken from Google.